After noticing all of the hits that the McCain 2nd Amendment post started getting, I decided it might be a good idea to take the wraps off the McCain opposition research page that we put together after SC, and post it for all interested readers. McCain on Guns- Not a reliable gun advocate. Supporter of anti-competitive fuel-emissions standards. Active suppressor of Free Speech for Political Action Groups. Member of the infamous “Gang of 14”, which impeded the President’s ability to nominate conservative justices. Flip Flops on issues just like Romney, but does not own up to them. Mark Levin takes McCain to the woodshed, while taking a back-handed swipe at Mike. Well…at least ol’beezelbub is gone. POS Chicago lawyer gets his day in court. I’m looking for a link, if y’all see it please post it. I’ll keep my eyeballs on it. The paper’s Jim Rutenberg has been leading the investigation and is described as beyond frustrated with McCain’s aggressive and angry efforts to stop any and all publication. The drama involves a woman lobbyist who may have helped to write key telecom legislation. The woman in question has retained counsel and strongly denies receiving any special treatment from McCain. Rutenberg, along with reporter David Kirkpatrick, has been developing the story for the last 6 weeks. Rutenberg had hoped to break the story before the Christmas holiday, sources reveal, but editor Keller expressed serious reservations about jounalism ethics and issuing a damaging story so close to an election. McCain campaign officials Rick Davis, Charlie Black and Mark Salter are also said to have met with the NEW YORK TIMES in an effort to halt publication. McCain and the telecom lobbyist misdealings? I’m not sure why McCain enjoys such a high rating in Florida polls….however, it could be explained, I suppose, by the high proportion of navy/retired navy who regard McCain as one of their own, as well as there were a great many southern Democrats turned Republican because of the wuss factor of the NE liberal Dems. McCain, in my view, is tough on terror but has the more liberal social views of a Democrat. Plus, John McCain, was the deciding vote AGAINST Internet freedom during a key vote this week in the Senate Commerce Committee. Whether or not McCain turns out to be guilty of any crime, he certainly appears guilty of the same corrupt beholdenness to K Street as any of Washington’s worst. There ain’t a dimes worth of difference between him and Hillary, ‘ceptin the GWOT. Prior to joining The Fritts Group, Kathleen M. Ramsey was the Executive Vice President of Public Affairs for the NAB. In this role, she was responsible for the organization’s grassroots lobbying operation, corporate communications and national campaigns. Kathy previously served as the Director of Human Resources for the U.S. Senate Sergeant at Arms and worked for the Grocery Manufacturers of America, Inc. where she was involved with legislative issues ranging from nutrition labeling and food safety to corporate tax. I know how to take McCain off message, and it is by using his basic unhingedness and his temper. Remember how he reacted to the dirty campaign in SC? It doesn’t have to be much, either get down and dirty with him, or continually confront him with his past record, and his behavior. If someone will provoke him, in whatever manner necessary, and make him explode and expose his true character as a bully, then the voting public will turn on him, just like they did in 2000. Call him a liar about his now denying his jamming immigration reform down our throats. Call him a liar about his other legislative accomplishments, as well. Bring up his abandoning his wife. Point out some of the bizarre jokes he has made. Anything, but make him get off message, and out of his comfort zone. Make him mad! Make him spend what money he has on ad buys to refute those claims, which can’t be that much, seeing as how his campaign was almost broke at the start of fall. Whatever it takes for him to blow his cool and spend his money, is what must be done to expose him, and render him unelectable. Trackposted to The Virtuous Republic, Rosemary’s Thoughts, The Random Yak, Right Truth, Shadowscope, Leaning Straight Up, Cao’s Blog, Big Dog’s Weblog, , Pet’s Garden Blog, third world county, A NEWT ONE- PLEASE UNITE NOW!, The Pink Flamingo, A Newt One- bloggers rountable, Celebrity Smack, Wolf Pangloss, Dumb Ox Daily News, A Newt One, Right Voices, and The Yankee Sailor, thanks to Linkfest Haven Deluxe. Would Ronald Reagan endorse your candidacy? I think it would be incredibly presumptuous and even arrogant for me to try to suggest what Ronald Reagan would do, that he would endorse any of us against the others. Let me just say this, I’m not going to pretend he would endorse me. I wish he would. I would love that, but I endorse him, and I’m going to tell you why. It wasn’t just his specific policies, but Ronald Reagan was something more than just a policy wonk. He was a man who loved this country, and he inspired this country to believe in itself again. What made Ronald Reagan a great president was not just the intricacies of his policies, though they were good policies. It was that he loved America and saw it as a good nation and a great nation because of the greatness of its people. And if we can recapture that, that’s when we recapture the Reagan spirit. It’s that spirit that has a can-do attitude about America’s futures and that makes us love our country whether we’re Democrats or Republicans. And that’s what I believe Ronald Reagan did — he brought this country back together and made us believe in ourselves. And whether he believes in us, I hope we still believe in those things which made him a great leader and a great American. Huckabee could go a long way towards rebuilding the Reagan coalition by offering the VP slot to Mitt Romney. It could work. Not a bad showing for the four candidates. Well, three. I like Ron Paul, he seems like a nice old man, and pretty smart. But his foreign policy creds are scary, and he is not a serious candidate. The questions were weighted heavily toward Romney and McCain. At least 4 to 1, I haven’t counted, but it sure seemed that way. 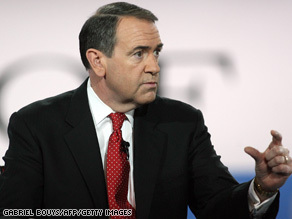 Plus, there was someone who would interrupt Huckabee on his few responses. I don’t know if it was Anderson Cooper, or someone else close to a microphone, but it was clearly an attempt to cut him off, when CNN had begun the night saying they would allow each candidate to give full answers without a clock. Huck hit it out of the park. Hopefully it will be up on youtube soon. I’ll post it when available. All in all: Huckabee gained ground, McCain probably lost ground, and Romney didn’t help or hurt himself – although he did effectively defend himself. McCain sounded petty – and that’s not the McCain voters know and like. are both expected to drop out of the Presidential race today. Huck is probably not far behind. Florida Primary. Good news, bad news. It looks like a McCain night. It also looks like it’s time for Huck to drop out. Maybe Rudy too. Then, it’s McCain v Romney. Hold the nose and vote for the nominee time. Just type in the artist that you’re searching for, and voila! So, naturally, I typed in Stevie Ray Vaughan. As governor, Romney authored and signed a mandatory heath insurance plan backed by Ted Kennedy – including taxpayer-funded abortion on demand. Trackposted to Allie is Wired, third world county, Adam’s Blog, Right Truth, Shadowscope, Blue Star Chronicles, Pirate’s Cove, The Pink Flamingo, Leaning Straight Up, A Newt One, Conservative Cat, and The Yankee Sailor, thanks to Linkfest Haven Deluxe. ST. LOUIS (AP) — Substandard care at a southern Illinois Veterans Affairs hospital may have contributed to 19 deaths over the past two years, a VA official said Monday as he apologized to affected families and pledged reform. The hospital in Marion, Ill., initially drew scrutiny over deaths connected to a single surgeon, but two federal reports found fault with five other doctors. The hospital undertook many surgeries that its staffing or lack of proper surgical expertise made it ill-equipped to handle, and hospital administrators were too slow to respond once problems surfaced, said Dr. Michael Kussman, U.S. veterans affairs undersecretary for health. “I can’t tell you how angry we all are and how frustrated we all are. Nothing angers me more than when we don’t do the right thing,” Kussman told reporters during a conference call after releasing findings of the VA’s investigation and summarizing a separate inspector general’s probe. Still, Kussman insisted, “what happened in Marion is an exception to what otherwise is a truly quality health-care system” across the VA. The VA will help affected families file administrative claims under the VA’s disability compensation program, he said. Families also could sue. The VA investigation found that at least nine deaths between October 2006 and March last year were “directly attributable” to substandard care at the Marion hospital, which serves veterans from southern Illinois, southwestern Indiana and western Kentucky. Inpatient surgeries have not been performed at the facility since problems first became public last August. They will remain suspended indefinitely, Kussman said. In pledging reforms, Kussman said the VA has launched an administrative investigatory board to review care problems and matters raised by employee groups. The VA last September also installed interim administrators to replace the Marion VA’s director, chief of staff, chief of surgery and an anesthesiologist, moving them to other positions or placing them on leave, Kussman said. The anesthesiologist has since quit, Kussman said. “The previous leadership will not return” to their former jobs, he said. The VA’s investigation cited by Kussman covered a two-year span, the VA said. The inspector general’s office blamed three deaths on substandard care at the Marion site, but that review covered only the past fiscal year, which ended in October, the VA said. That report was not immediately available Monday. Telephone calls on Monday seeking comment from the Marion VA were directed to spokespeople with the agency’s Washington headquarters. Neither Kussman nor the VA investigation’s 41 pages of findings named surgeons involved in the deaths, though Kussman acknowledged that much of the criticism has focused on Dr. Jose Veizaga-Mendez. Veizaga-Mendez – identified in Monday’s report as “Surgeon A” – resigned from the hospital Aug. 13, three days after a patient from Kentucky bled to death after gallbladder surgery. All inpatient surgeries stopped a short time later. Veizaga-Mendez and another surgeon no longer practice at the Marion VA. The remaining four surgeons remain on staff but are “only doing minor cases at this time,” Kussman said. Veizaga-Mendez’s whereabouts are unclear. He has has no listed telephone number and has been unreachable for comment. Veizaga-Mendez was permanently barred from practicing medicine in Massachusetts last November – a disciplinary move that also requires him to resign other state medical licenses he may hold and withdraw pending license applications. He has also made payouts in two Massachusetts malpractice lawsuits.